With their built-in X-BIONIC Partial Kompression leg design, specially developed for long-distance running, men’s and ladies’ X-Socks Accumulator Running Socks deliver immediate results as the complex pattern of textile compression and cooling mechanisms stabilise your muscles, optimise the transport of nutrients and keep you optimally cool. The unique look and features of X-Socks Accumulator Running Socks encompass 14-way patented protection, from the self-adjusting cuffs on down through cooling channels and X-Cross bandaging for stability and injury limitation, to protective strategic ankle, Achilles and heel padding, instep support and anatomic left/right specific shaping. Bacteria-limiting Skin-NODOR and breathable Mythlan fabrics give long-term protection, and, along with toe pads and flat seams, defy the causes of foot odour, blisters and chafing. 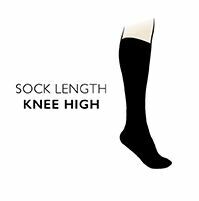 Swiss sports sock experts, X-Socks even place positioning lines down the socks to ensure perfect placement and optimal benefits!